WHEN: Friday nights: September 21 through October 12, 6:00 - 9:00 p.m. Kick off your fall weekends on the Jersey City waterfront with some fiery Latin music! 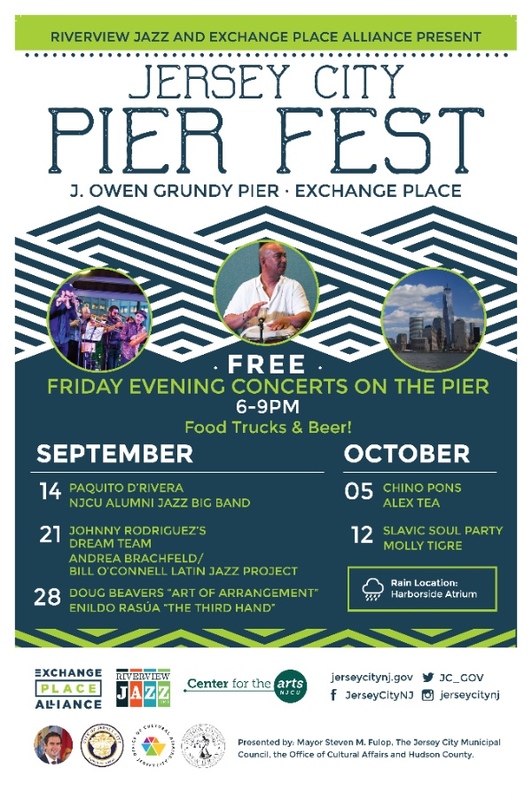 Riverview Jazz and Exchange Place Alliance have partnered to bring this exciting free series to the J. Owen Grundy Pier at Exchange Place. The four-part Friday evening series will feature world-class music, food trucks, and cold beer provided by Lutze Biergarten. Each PierFest event begins at 6pm and will present two bands. PierFest begins Friday September 21 with the legendary Tito Puente sideman John “Dandy” Rodriguez’s Dream Team and the dynamic flautist Andrea Brachfeld/Bill O’Connell Latin Jazz Project. September 28 hosts Grammy-nominee Doug Beavers Art of the Arrangement and Cuban drumming titan Enildo Rasua “The Third Hand”. In a special Jersey City Artist Studio Tour edition, October 5 will feature Cuban vocalist Chino Pons and Jersey City native Alex Tea with his Brazilian and reggae-inspired band. The final concert October 12 stars two Brooklyn-based horn heavy ensembles, Balkan brass band Slavic Soul Party and the African-influenced Molly Tigre. (For list, see below). PierFest is sponsored by Exchange Place Alliance, a not-for-profit Special Improvement District. PierFest is also made possible in part by Mayor Steven M. Fulop, the Jersey City Municipal Council, and the Office of Cultural Affairs. RiverviewJazz.Org is a 501(c)(3) not-for-profit organization. John “Dandy” Rodriguez Dream Team 7:30 p.m.
Andrea Brachfeld/Bill O’Connell Latin Jazz Project 6 p.m.
Doug Beavers Art of the Arrangement 7:30 p.m.
Enildo Rasua “The Third Hand” 6 p.m.
Slavic Soul Party 7:30 p.m.
FUNdraiser Fiesta! LINE DANCING Saturday night! Great Gatsby! Don't Miss The Great Book Swap! This Is Your Last Chance to SAVE BIG TIME @ STNJ!